This let you use the Sharp Pages and Sharp Code Pages features to build your entire .NET Core Web App with Templates without needing to use anything else in ServiceStack. This has the same effect as it has in a ServiceStack Service where the PageResult sets the Content-Type HTTP Response Header and asynchronously writes the template to the Response OutputStream for maximum performance. Checkout the NetCoreApps/MvcTemplates repository for a stand-alone example of this, complete with a sidebar.html partial and a CustomScriptMethods.cs. 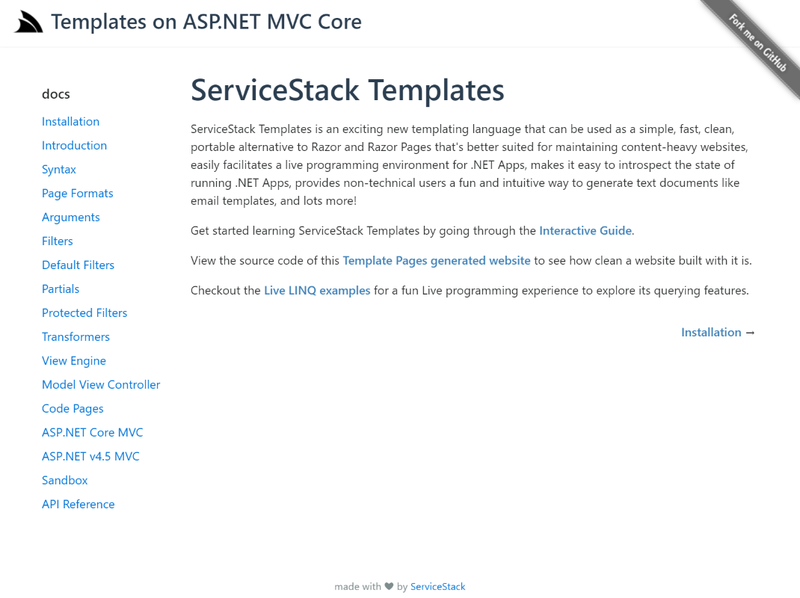 Checkout the ServiceStackApps/MvcTemplates repository for a stand-alone example, complete with a sidebar.html partial and a CustomScriptMethods.cs. This demo was created from the ServiceStack ASP.NET MVC5 Empty VS.NET Template.